First initiated at Institute of Planetology and Astrophysics in Grenoble (IPAG) , this experiment is now also developped in several other cities and several countries. A century later, this experience has been totally redefined by Jean Lilensten, Resarch Director (CNRS) at the Institute of Planetology and Astrophysics in Grenoble (IPAG), and his friends, collaborators and PhD students (M. Barthélémy, C. Simon, G. Gronoff and P. Jeanjacquot). The number of copies keeps growing up in different places around the world thanks to other colleagues. 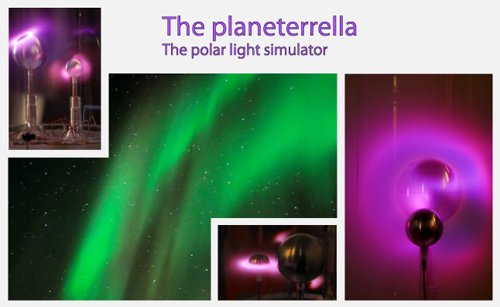 The new design is inspired by Birkeland’s Terrella and remains a demonstrator of the polar lights (aurora). But its great flexibility allows simulating a large amount of the different interactions between the stars and the planets: Uranus and Neptune with their inclined axes, the interaction between Ganymede and Jupiter, jets and stellar rings and even the interaction between a magnetized exoplanet and a nearby star. Therefore, this experience is now the Planeterrella.